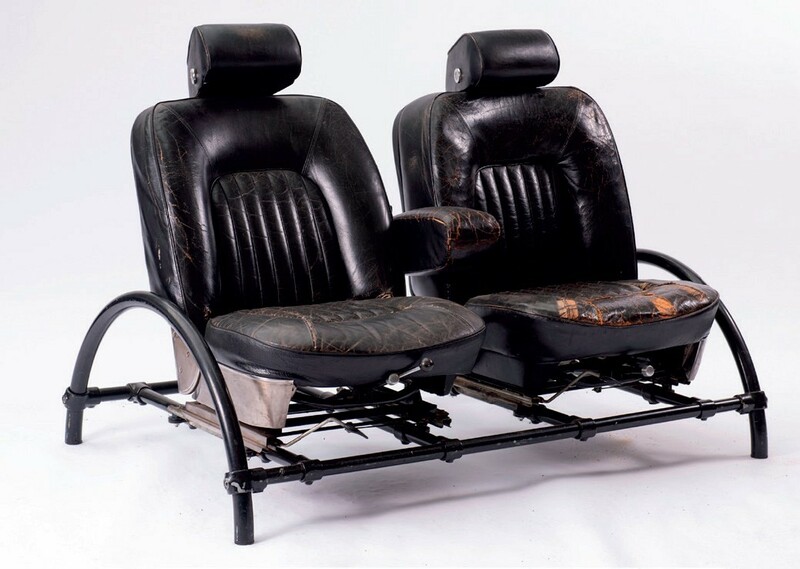 Rover Double Seater, manufactured in 1981 by Ron Arad’s One Off company, which is estimated at €3200-4500 in the Quittenbaum auction on February 20. Quittenbaum in Munich is offering one of his works from this period in the sale of February 20. It is a so-called Rover Double Seater, manufactured in 1981 by Arad’s One Off company. The series, which launched Arad’s career as a designer, came about when he recovered two leather seats from a rusting model of a Rover 2000 he had found in a scrapyard. He fitted the leather onto a framework of Kee Klamp scaffolding, a system that had been in use since the 1930s. Until 1989 Arad produced hundreds of his Rover chairs as single seaters, which originally sold for £99, and double seaters such as the one in Munich. The chairs on offer (above) have obviously a fair bit of mileage: one of them is quite worn, a fact reflected in the guide price of €3200-4500.